The show on Friday will also include visuals from a visual jockey, Nina Dillenz, who studied theater, film, and media at the University of Vienna. This will be the first time she’s collaborating with us. This page has more information about the show, including how to get tickets (50 RMB advance, 60 RMB door). Spittunes is part of Spittoon. Please check out and support this literary community’s other great events and work. 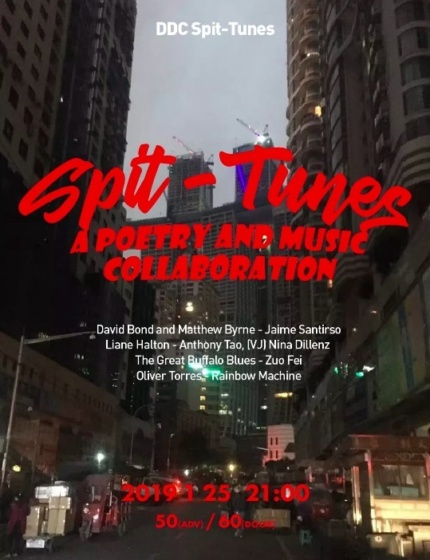 Spittoon is Beijing’s main stage for poetry and fiction writers, with reading nights taking place across the city and a bi-annual literary magazine that sells in outlets all over town.